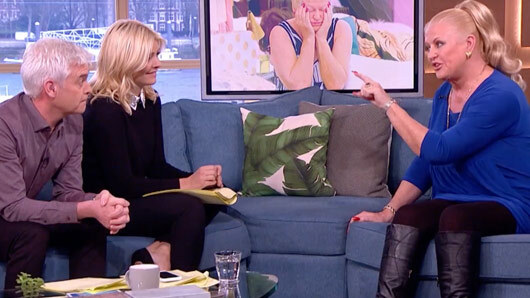 Celebrity Big Brother‘s Kim Woodburn lashed out at presenter Phillip Schofield during her interview on This Morning today. The How Clean Is Your House star appeared on the ITV show this morning to discuss her time in the Celebrity Big Brother house. However, the conversation soon got pretty heated after host Phillip pulled Kim up on her behaviour. Holly Willoughby continued to ask Kim why she did not exit the house if she found the experience so difficult. Phillip interrupted to ask the cleaning professional how much she earned on the show, to which Kim retorted: “It’s nothing to do with you Philip, what are they paying you? Don’t be cheeky! “I think I am a nice person. I’d like you to have a word with all the crew I’ve worked with from the studio. I’m very polite. I have not have rows elsewhere. “No but we all watched it on the television,” Phillip pointed out. Kim may have hated her time in the CBB house, but she does not regret appearing on the series. She explained: “I love the money. Adorable. No I don’t regret going in. I may be 74 but don’t mess with me. I’ve been around too long. Although there were tensions during the interview, the host later revealed that there were no hard feelings between the two television stars off of the camera.